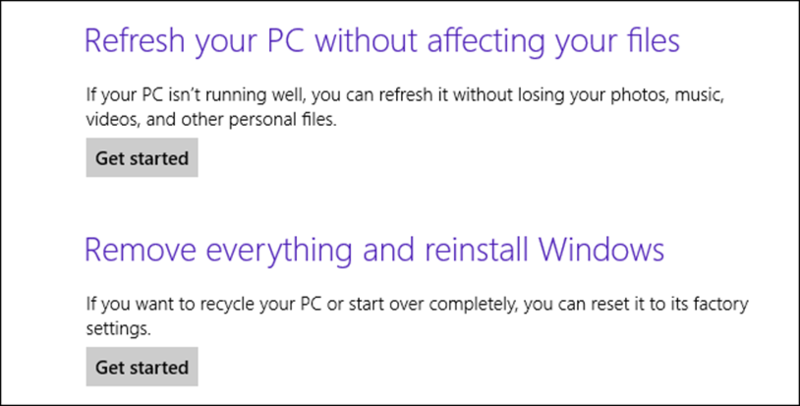 Thinking of using the new ‘Refresh Your PC’ option in Windows 8 / Windows 10 ? We have taken a number of calls over the last couple of days from customers who have been advised (not by us mind) to run the new ‘Refresh Your PC’ option in Windows 8 / Windows 10 to speed up their PCs. Whilst this seems like a great idea and it claims it will ‘Refresh your PC without affecting your files’ (as shown below), this as it turns out is definitely NOT the case. And therein lies the problem. EazyEFT and every other application (Word, Excel, Payroll, Accounts etc.) on your PC will be removed. Not only will the applications be removed, but all the applications data files will be removed as well. Yes, you will still have your Word Documents, Excel Spreadsheets and your Music files from your My Documents folder, but your EazyEFT data file that contains all your customers / suppliers details and full historical data will be lost and cannot be recovered. If you absolutely need to do a ‘Refresh your PC’ or the more drastic ‘Reset your PC’ then please ensure that you have a backup of your ENTIRE PC before proceeding (and not just your My Documents folder). That way you should be able to recover everything, albeit that each and every application will need to be reinstalled manually one by one. If you are in any doubt whatsoever then please contact our Customer Helpline number above beforehand, so that we can at least ensure that you have a copy of your EazyEFT data file in case something goes wrong. Lir Software do not have access to your EazyEFT data, nor do we keep copies of your data. Your EazyEFT data file(s) is stored on your local PC (or on your company file server) so it is your responsibility to ensure that you have a backup of your own data in cases of catastrophic system failure. See our Best practice for backing up your EazyEFT data post for further details.